The lab is an energy research facility. As such projects involve a diverse range of energy systems from electrical and mechanical to petrochemical. A sampling of the energy systems are shown. We have exceptional, experienced researchers and academics who can help you with your high-energy project. Our electrical, mechanical, and petroleum engineers and consultants have many decades of combined experience in research and testing of devices and systems. Our clients run the gamut from small one-time projects to the most sophisticated for the largest corporations in the world. If you can dream it, we will work with you to make it happen. We operate ovens that can reach 1800 F / 1000 C.
These are particularly appropriate for determining performance properties of sophisticated elastomers, to ceramics and metals. Our lower temperature section performs burn tests using a wide variety of heat sources from pans to electric sources and open flames. We use temperature sources in excess of 5000 F to evaluate metal performance. In addition our welder system can manipulate a variety of steels. High pressure evaluation is performed in appropriately rated chambers and in test wells. Pressure projects vary from utility level gas to well operations in excess of 1000 psi. Oil and gas equipment is routinely operated in the range of 500 psi. Custom equipment operates in excess of 5000 psi. 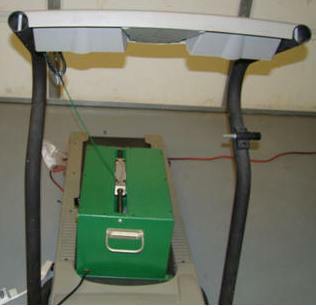 A Humboldt motorized shaker is the platform for a wide variety of mechanical research. The machine provides for mechanical abrasion, mechanical stress, shaking, and mixing. Our consultants use the facility to research explosives, as well as volatile oil & gas projects. A range is on location for projectile tests. Area is available for controlled burns. The high energy electrical research equipment provides the premier, most sophisticated equipment in the region. The operating environment allows very low level research and measurements. Our partial discharge equipment has been used to evaluate everything from cable to heaters and motors. The ability to research low energy levels is critical to electronics and sensitive devices. The lab has provided cutting-edge research in low energy ignition of combustibles. Consumer product evaluation is a common event in the lab. The principals have been researching lightning and controlling its damage for decades. The lab has the industry standard test equipment as well as research fixtures we have developed. We provide product acceptance testing and evaluation for a variety entities. One valuable service is we are an independent third party laboratory who can provide intermediary evaluation between a manufacturer and client. Because of the lab's exceptional facilities and equipment, we perform failure analysis on damaged appliances and artifacts for the insurance and legal firms. This is a very cost effective procedure that provides professional analysis at a fraction of the cost of on-site investigations.